Husband tiled the floor. The goal was to blend the 15 year old light mocha colored fixtures with the floor. The tub enclosure was already a multi blue tile. 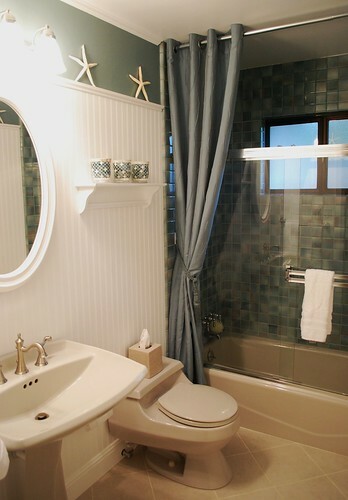 Used a regular 8 foot curtin panel from Bed Bath & Beyond to dress up the tub a bit. Did not need a shower curtin since the tub has the glass sliding doors. Was able to bring back the clarity of the 15 year old glass doors using Mr Clean Magic Eraser for bathrooms.